Cambridge Preparation for the TOEFL® Test, Fourth Edition, helps students master the language skills they need to succeed on the TOEFL® iBT and communicate effectively in an academic setting. Using an integrated skills approach that mirrors the structure of the TOEFL® iBT, this fully revised text is ideal for classroom use and self-study. The book contains hundreds of skill-building exercises covering all of the question types in the exam and four practice tests. A supporting skills section is provided to improve grammar, vocabulary, pronunciation and study skills. The CD-ROM includes the tests from the book plus three additional practice tests in an electronic format that simulates the online TOEFL® iBT. The audio program, available on Audio CDs or Audio Cassettes, contains conversations, lectures, and all listening material for all listening exercises and test questions. Well, it’s time to really analyze the book that I’ve been recommending to students for years. I’ve always known it’s not perfect, but Cambridge Preparation for the TOEFL has enough good aspects that it’s been my favorite TOEFL book for a long time. But don’t be surprised if I say a lot of negative things about the book in this post. While carefully going through Cambridge Preparation and listing the problems and benefits, I actually surprised myself with more flaws than I expected. There are plenty of pieces that could be better. But, then again, that’s true with every other TOEFL prep book I’ve used, and the strengths of Cambridge’s book are important enough that it’s still a valuable resource. Let’s break it down and look at the details. The front cover of Cambridge Preparation makes very clear one of the best features of this book: it includes a CD with 7 full-length practice tests. And what’s more, that software is very similar to the software of the actual TOEFL iBT. The buttons are the same. The clock is the same. It’s actually more similar in format than the practice tests that come with the Official Guide, strangely. For example, in the Official Guide software, the listening section has a clock which counts down even during the recordings. That’s not true on the real test, and Cambridge recognizes that—the practice tests on the CD only count down while you’re answering questions, not while you’re listening. But I found a major issue with that software: it doesn’t work on new Macs. If you have an Apple computer that uses OSX Lion or higher (10.7+), then you can’t use the CD. That means you don’t have access to the audio for the three full practice tests in the book norany access to the additional four practice tests that are only on the CD (the three in the book are repeated on the CD). Besides that, even if the software does work on your computer, it’s not very easy to use. You can’t easily navigate through the practice tests if you want to use the material for non-full-length practice. It freezes, sometimes. If you want to save your recordings, you have to make an account. It’s generally not very well-made software. But the fact that it is so similar to the real ETS tests helps to excuse that fact. In the book, there are additional practice sections of each of the four skills, separated from each other, mixed in with the skill-building practice. If you add that to the full-length test practice, you have a very good amount of practice material altogether (assuming you can use the CD). Geologists have shown that for about 80 percent of the past 2.5 million years, ice-age conditions have prevailed on the Earth’s surface. The answer they give as correct is (B), and that’s fine; that’s the best answer. But there are two problems, here. For one, answer choice (A) actually works well in context and wouldn’t change the meaning much. That makes it too tempting. Besides that, answer choice (D) is a good synonym for “prevail” when it’s used in another sense—the more common meaning, actually. The TOEFL doesn’t put synonyms like that in the answer choices. You would never get a question like this on your test. Questions like these are only 5%–10% of the reading, and they’re even less common in the other sections, but they appear there, too. In that same practice test, there’s a speaking task (question #5) which has you listen to two students discuss four different ways to memorize vocabulary, after which you summarize and pick one of the four as your favorite. On the real TOEFL, you’ll only hear two options in speaking task #5. That may seem like a small detail, but it greatly changes how you manage your time while speaking. These problems are relatively uncommon, but they’re important to note. When the practice is good, it’s very similar to the real TOEFL. The listening recordings are almost exactly what you’ll hear on the test. The reading passages are all well done. The essay questions are generally accurate. Sometimes, though, it does have big flaws. This is the second big imperfection in Cambridge’s book: the explanations for the practice tests are too short. They don’t discuss the wrong answers, and they usually don’t give any helpful information. They’re very similar to the explanations in ETS’s Official Guide. But the explanations for the rest of the book—the focused practice—are much better. Besides that, on the CD, there are many very good sample recordings for the speaking section and sample essays for the writing section. Those good parts help to balance the too-short explanations a bit, but not totally. The book could still be improved here because this is one of the most important parts of areally good preparation book: you need to learn from your mistakes if your scores will increase. Without a good explanation, it’s hard to learn. Now that I’ve written a lot about Cambridge’s problems, let’s talk about why I still recommend it to students. Cambridge Preparation gives more skill practice than any other book I know of, and it gives good practice. There are lessons and exercises for every single skill that you need on the TOEFL, and they’re organized into step-by-step lessons that start from the very basic skills and build up to more test-like practice. They include topics like transitions, paraphrasing, understanding connections made by referents (such as pronouns), organizing your essay, and others. This makes Cambridge very valuable for long-term TOEFL preparation. There is one more problem, though. And this is really a big problem for many students: you need the 8 additional audio CDs to really make use of this part of the book (the most important part). It’s possible to buy only the book and CD-ROM without the audio CDs, and that can be confusing. But those audio CDs aren’t cheap, either; they’re much more expensive than the book alone. But if you have them or can afford them, the listening exercises (and the related speaking and writing) are just fantastic. If you have a month or more to prepare for the TOEFL and you’re going to spend a significant amount of time preparing, then Cambridge has great skill-building exercises that’ll be very helpful (if you don’t mind spending the extra money for the CDs). For test-like practice material, though, there are better books. And if you prefer to learn online from videos, there’s our premium TOEFL prep as well. I have very positive feelings about this book. I was required to take the TOEFL test by the time of January 2010 by the college I applied to. I have been studying English for about 10 years and during the last two I am using it as a primary language in school. Knowing only very roughly what the TOEFL looks like I began my preparation about a week before the exam. Sounds like very little time, but ultimately I scored 105 points (120 is maximum in the iBT). I'm proud of my score and it more than enough for my college appliaction. This Cambridge book was a large help here. It talks about each section and each question type in great detail, but you still can feel why each of these details matter and why knowing them can help you. I strongly suggest buying the version of the book with CD-ROM and 8 audio CDs (the one which costs $89). The audio CDs contain quite big amount of listening and speaking exercises. One more thing: in my view, the most difficult part of the TOEFL iBT is speaking. Prepare well for it by recording yourself and paying attention to time. Attached CD-ROM with a program that simulates the test is very helpful here. Not only here, actually - it makes you feel comfortable with the test interface, which is important. I am an ESL teacher and I teach courses in TOEFL preparation. In my opinion, most of the sections of this book do not accurately represent TOEFL test questions. The authors do not seem to have had an in-depth understanding of the writing and speaking scoring rubric, or an understanding of how the listening and reading questions are composed. I do not recommend this book to anyone planning to take the TOEFL test. on the real test, or is wasting time trying to answer questions that would never be asked on a TOEFL test. Worse, in many cases the answer choices do not contain a clear, correct answer, regardless of what the answer key claims. In some cases, the answer choices are too vague or, I believe, simply incorrect. Also, the authors have divided up the section into the different types of questions that can be asked, but with little rhyme or reason, as they have lumped questions into the inference section which are clearly not inference questions (and not considered inference questions by the test makers), and ignored some other types of questions. The listening section is slightly better, but the book does not come with the listening CD's, so the student will not be able to use this section. Nevertheless, there are quite a few places in the listening where the questions do not accurately represent TOEFL questions, although to the inexperienced eye the format appears similar. The speaking section is quite sparse and offers little useful advice to the student. There are no samples available on CD of how different score levels will sound. I did not use the writing section at all, so cannot comment on the exercises there, but the explanation of the scoring rubric and the sample papers shown in the book do not reflect an understanding of how TOEFL papers are actually scored. You will find much better samples that give a much more accurate idea of what a high or low scoring essay looks like in the book published by ETS. Finally, the book is loaded up with "supporting skills" exercises, which seems like a good idea, except that often the skills practiced will not be found on the actual test. Moreover, the questions and answer choices in the exercises are so carelessly done that there are many instances of answers which don't make sense, choices that are too similar and too vague, and questions which don't use the skill one is supposedly practicing. And one more thing - the book is overly large and not at all user friendly. It's hard to find anything in it, and sometimes the exercises that go with certain materials are located at the end of the unit instead of directly after the material. One of the few good things about this book is the ETS scoring rubrics and scoring instructions provided in the front of the book, which allow you to figure out your TOEFL score. Also, it is useful to have actual computerized practice tests that reflect the testing conditions and can give the student practice with the real test format. Other than that, I really don't like this book and would never willingly use it again for a TOEFL class. Deference to website author, some excellent information. Hi ! I am thankfull for your books posted here with us ! God bless you. Greetings from Brazil. The book is good. But CD-ROM and Audio zip files are corrupted. Please do something about it. 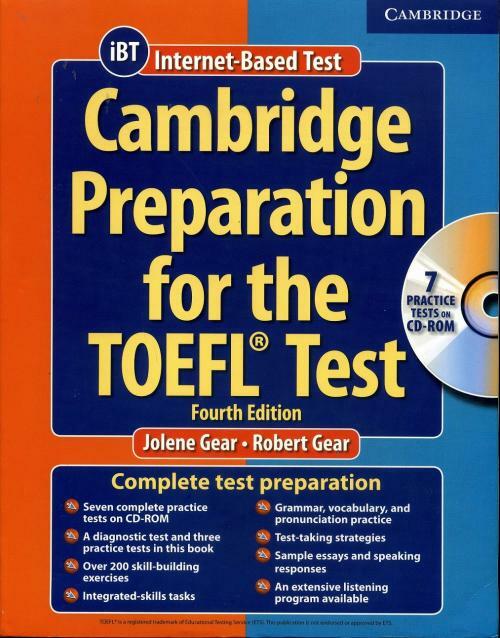 Hi all, I just have updated all link download the book: Cambridge Preparation for the TOEFL Test 4th edition (Book & CD-ROM). Now all link are live, clean & clearly, you can easy download. Thank @Keti for reminding me about broken link. Hope all can get the book and archive high scores in TOEFL.